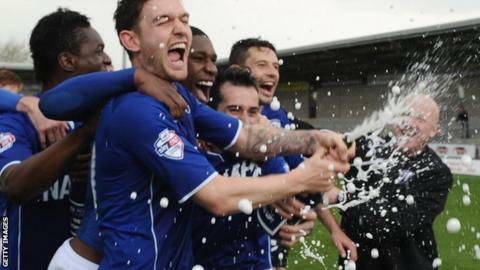 Chesterfield sealed promotion to League One with victory at a soggy Burton thanks to Jay O'Shea's double. O'Shea turned home from inside the box seven minutes into the second half from a pass by veteran Ritchie Humphreys. Eoin Doyle laid on midfielder O'Shea's 79th-minute clincher, allowing the Irishman to poke home from close in. Sam Hird headed against the bar for the visitors and Gary Roberts curled a free-kick just over, while Lee Bell's tame drive was as close as Burton came. Chesterfield's win takes them back to top spot in League Two, above title rivals Rochdale on goal difference. Barring Rochdale winning by a cricket score at Newport next Saturday, Chesterfield will lift the title if they win at home to Fleetwood. Burton, who have already secured their play-off place, remain fifth. "They showed that little bit of extra quality than us. That maybe has been the difference between us getting automatic promotion instead of the likes of Chesterfield. "It stunk of an end of season performance really, if I'm being honest. We had nothing to play for. They had everything to play for. "I was disappointed with the players. I said: 'Listen, if you think that's enough then you're sadly mistaken because one or two of you looked terrible today'. "They just didn't look like they had anywhere near enough energy or athleticism. That maybe has altered my thinking for one or two of the play-off games and it'll be their own fault for that." Match ends, Burton Albion 0, Chesterfield 2. Second Half ends, Burton Albion 0, Chesterfield 2. Attempt saved. Jay O'Shea (Chesterfield) left footed shot from the right side of the box is saved in the centre of the goal. Attempt blocked. Alexander MacDonald (Burton Albion) right footed shot from outside the box is blocked. Alexander MacDonald (Burton Albion) wins a free kick in the defensive half. Dominic Knowles (Burton Albion) wins a free kick in the defensive half. Attempt saved. Jay O'Shea (Chesterfield) right footed shot from the centre of the box is saved in the centre of the goal. Marcus Holness (Burton Albion) wins a free kick on the left wing. Ian Sharps (Burton Albion) wins a free kick in the attacking half. Corner, Chesterfield. Conceded by Callum McFadzean. Armand Gnanduillet (Chesterfield) is shown the yellow card for excessive celebration. Goal! Burton Albion 0, Chesterfield 2. Jay O'Shea (Chesterfield) header from very close range to the top right corner. Attempt missed. Ashley Hemmings (Burton Albion) left footed shot from outside the box is too high from a direct free kick. Gary Alexander (Burton Albion) wins a free kick in the defensive half. Substitution, Burton Albion. Dominic Knowles replaces Lee Bell because of an injury. Corner, Chesterfield. Conceded by Marcus Holness. Marcus Holness (Burton Albion) wins a free kick in the defensive half. Attempt saved. Lee Bell (Burton Albion) right footed shot from outside the box is saved in the top centre of the goal. Callum McFadzean (Burton Albion) wins a free kick in the defensive half. Attempt missed. Gary Roberts (Chesterfield) left footed shot from outside the box is just a bit too high from a direct free kick. Gary Roberts (Chesterfield) wins a free kick in the attacking half. Foul by Alexander MacDonald (Burton Albion). Corner, Chesterfield. Conceded by Lee Bell. Attempt saved. Marcus Holness (Burton Albion) header from the centre of the box is saved in the top centre of the goal. Corner, Burton Albion. Conceded by Sam Hird. Substitution, Burton Albion. Ashley Hemmings replaces Billy Kee. Substitution, Burton Albion. Zeli Ismail replaces Robbie Weir. Attempt blocked. Jay O'Shea (Chesterfield) right footed shot from the centre of the box is blocked. Corner, Burton Albion. Conceded by Thomas Lee. Attempt saved. Billy Kee (Burton Albion) right footed shot from the left side of the six yard box is saved in the bottom left corner. Goal! Burton Albion 0, Chesterfield 1. Jay O'Shea (Chesterfield) right footed shot from the centre of the box to the bottom left corner. Assisted by Ritchie Humphreys.